A Quirky Kook: The Boy and The Flying Scotsman, A Life Story. The Boy and The Flying Scotsman, A Life Story. We have a thing about steam engines at Quirky Kook Towers. Well, when I say we. I mean The Man and The Boy have a thing about steam engines and the rest of us spend an inordinate amount of time looking at, and riding on, steam engines while wondering where the shops are. 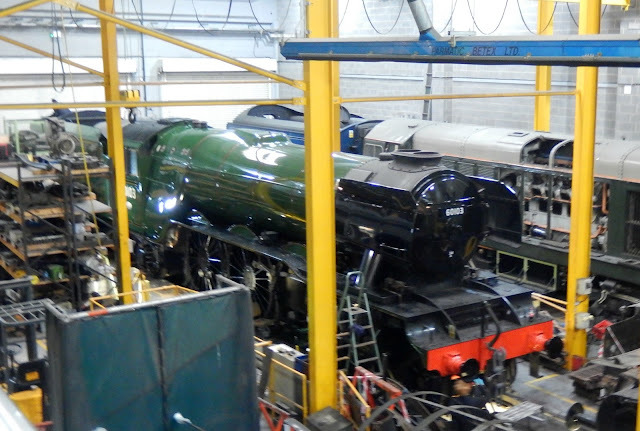 But there are some steam engines that capture the imagination and The Flying Scotsman is one of those engines. Built in 1923, in Yorkshire of course, and proudly shown in the British Empire Exhibition the following year, it was the first engine to reach 100 mph, during a test run in 1934, and earlier, in 1928, it hauled the first ever non-stop run from London to Edinburgh in just eight hours. Arguably it is the most famous locomotive in the world. In 2004 The Man, I and three year old Daughter 3 were, by chance, on the platform of York Railway Station as The Flying Scotsman steamed in on one of it's last journeys before departing for the National Railway Museum's workshop for a multi-million pound refit. That refit has taken a while mind. Long enough for The Boy to be born, two years after The Flying Scotsman's last journey on the rails, and to grow into a strapping nine-year-old with a passion for steam engines that equals his father's. He has, over many, many visits to the NRM, seen the Flying Scotsman, or the 'Scotter' as he called it when he was a toddler, in various states of disrepair and repair and been reminded repeatedly by his sister that she saw it in steam once upon a time. 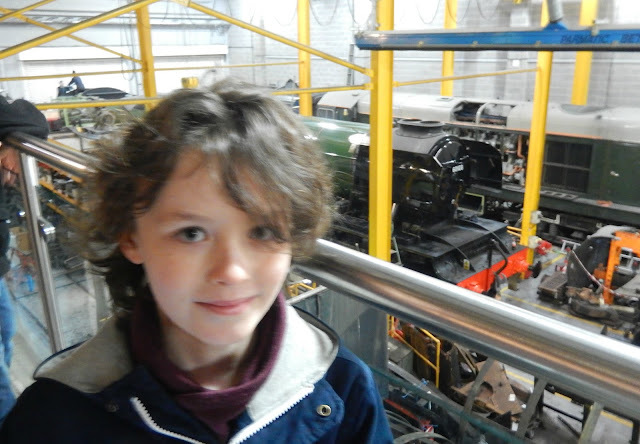 The Boy has waited a lifetime, literally, to see The Flying Scotsman back on track. 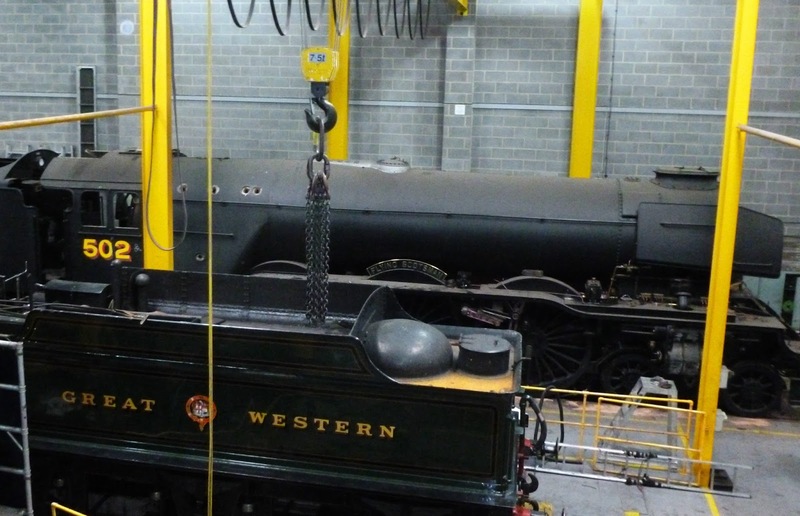 The Flying Scotsman, mid transformation, in The Works, NRM 2011. I think they might have taken it apart and put it back together again since then. Now the most famous locomotive in the world is restored, repaired, refitted, refurbished and, finally, repainted in its characteristic BR Brunswick green livery. Today it set off on it's celebratory inaugural run from London's King's Cross to York. We would, of course, have dearly, dearly loved to be on that train but tickets were a whoppingly expensive £450. So instead last weekend we went once more to the NRM to see the final touches being put to the Flying Scotsman in The Works before it returned to the rails. Meanwhile The Boy has compiled an itinerary of where and when The Flying Scotsman can be seen over the next few months and is determined where it will be, so will we. He's stuck it to the fridge too so we don't forget. 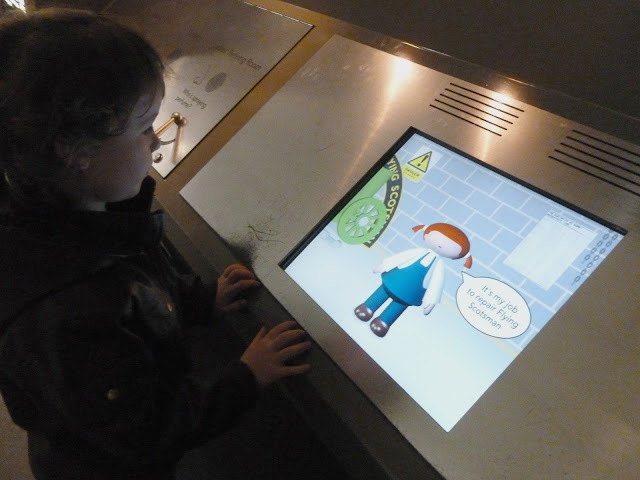 First stop, the National Railway Museum. Again.